SAN ANTONIO (AP) Looking for some extra offense with two of their top scorers out, the Spurs turned to their defense. 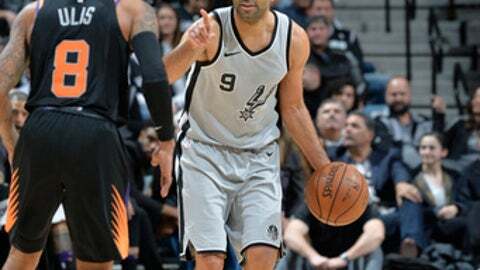 Kawhi Leonard and Manu Ginobili each scored 21 points and San Antonio set a season high in steals in beating the Phoenix Suns 103-89 on Friday night. Playing without starters LaMarcus Aldridge, who sat out for rest, and an injured Danny Green, the Spurs responded by scoring 29 points off 23 turnovers. San Antonio had 15 steals and six blocks, fueling a 31-13 advantage in fast-break points. Leonard was at the forefront of the defensive effort. The two-time NBA Defensive Player of the Year set a season high with three blocks and tied his season best with four steals. Leonard ran down Devin Booker from behind to block a layup early in the first quarter and minutes later stepped in front of Tyson Chandler for a steal that led to a breakaway dunk. ”Kawhi is getting to look more and more like himself every game,” Spurs coach Gregg Popovich said. It was Leonard’s eighth appearance after missing the season’s first 27 games with right quadriceps tendinopathy. Leonard had eight points during a 26-3 run after San Antonio fell behind by eight points two minutes into the second quarter. Ginobili also drew the Suns’ attention, scoring 15 points in a decisive third quarter. Ginobili joined Vince Carter as the only 40-year-old players to score 20 points off the bench. He shot 7 for 10 from the field in setting a season high for points. Booker had 21 points and Marquese Chriss added 12 for Phoenix, which lost its ninth straight in San Antonio. Booker finished 8 for 17 from the field after shooting 5 for 7 in the opening quarter. Suns: F T.J. Warren did not play after being listed as questionable due to an illness. Phoenix was also without F Jared Dudley (illness). … The Suns have made a 3-pointer in 1,099 consecutive games since March 29, 2004. It’s the second-longest streak in NBA history to Dallas’ 1,108 straight from Feb. 27, 1999, to Dec. 12, 2012. … The Spurs have won 12 of the last 13 in the series. Phoenix’s last win in San Antonio was Feb. 27, 2013. Jermaine O’Neal had 22 points in the 105-101 victory. Spurs: Aldridge has missed only two games this season, both for rest. … Green missed his second straight game and seventh overall with tightness in his left groin. … Joffrey Lauvergne exited with 2:56 left in the first half after colliding nose to forehead with Chriss, but returned to the Spurs bench midway through the third quarter. He played seven minutes in the fourth, finishing with three points and six rebounds in 15 minutes. Ginobili was asked if he prepared for the season any differently considering he has had such a dynamic start to his 16th season. Ginobili is averaging 8.5 points, but has been active on both ends and has been dunking like he did in his first years in the league. Popovich praised Booker before and after the game, calling the 21-year-old a great player. Suns: Host Oklahoma City on Sunday night. Spurs: Visit Portland on Sunday night.